Let’s have a chat about all the wonderful ways that Microsoft SharePoint benefits your business. With the vast array business-related productivity tools and software packages, it frequently feels like there’s too much to choose from. If your business is already running several tools and platforms, the prospect of adding another (or migrating to a new one) can be exhausting. In business we often work with the default tool we are exposed to, and that tool is often not the best for the job. Ultimately, it’s a platform. 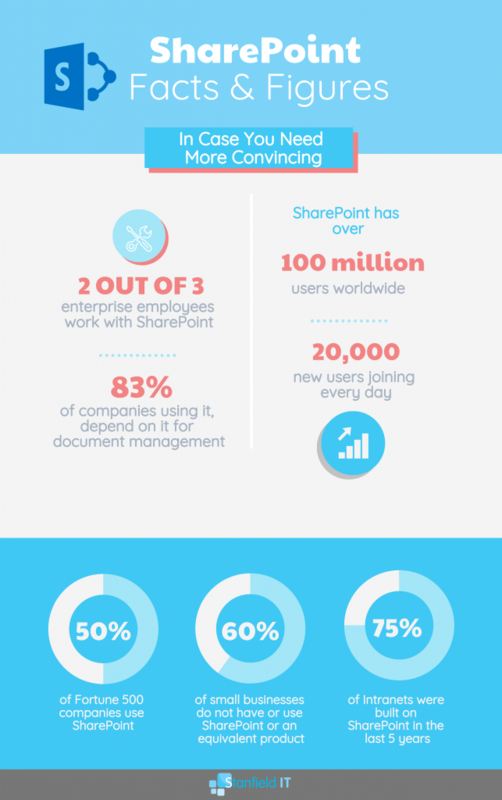 If you need a way simplify your document sharing and collaboration, then SharePoint is the tool you need. Share files and documents within your team or organisation without needing to keep track of the latest version. It’s a cloud-based server for all your internal resources and files that anyone within your organisation could need. Consider it as an internal directory containing all the information you could need to perform any task or project within your business. And if it doesn’t exist, you can create it. As a part of the Office 365 suite, SharePoint naturally integrates with other Microsoft Apps. This especially applies to Microsoft Teams. Teams and SharePoint work hand-in-hand to make your collaborative projects significantly simpler and easier (but we can delve more into that later). It works by creating a secure site that can be used to store, share, access and organise information. This site is your team’s private directory for hosting all documentation relevant to that team or project. It greatly simplifies the collaboration process. This has possibly led you to wonder, what’s the difference between a tool like Microsoft SharePoint, and OneDrive? 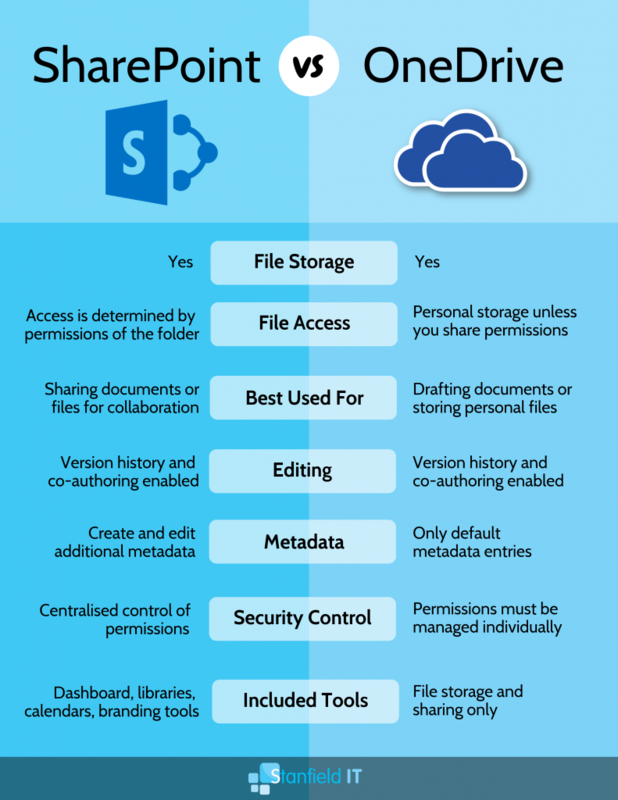 At a glance, SharePoint vs OneDrive seems like they both perform the same role. To try and summarise the difference: SharePoint focuses on sharing files within a group or team capacity (with the ability for all invited members to edit those files) and OneDrive is more of a personal storage facility, much like having ‘My Documents’ on the cloud. So far, we have covered a very simplified overview of what SharePoint is. But how about digging into what SharePoint can really do for your business. What are the SharePoint benefits to you? What are SharePoint lists? Is SharePoint a database? What makes it such a special product? Firstly, SharePoint stands out for being not just a singular ‘product’ per se. It’s a centralised system for managing information and team work. 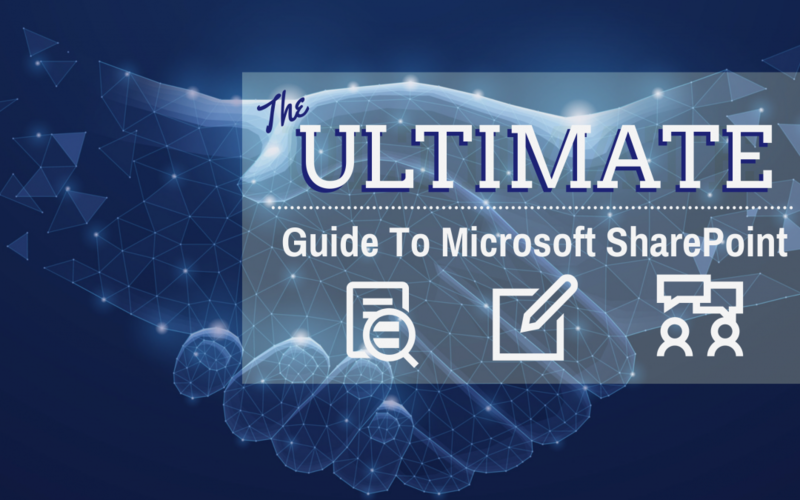 That sounds like some really scripted marketing jargon, but Microsoft SharePoint is truly more than just a storage hub and it has so many components that it becomes difficult to simplify without using such marketing-sounding-descriptions. Create automated, customised alerts to notify you when changes are made to a certain file or library within SharePoint. Keep track of any changes or deletions to files that matter to you and make sure you don’t miss anything important. These alerts come to you as email notifications and you can choose if you want them as an immediate notice, or daily/weekly summary. As an example, instead of constantly checking in with that report you wrote, just wait for an alert to advise you when your boss has reviewed it. You can also subscribe other team members to alerts to keep them apprised of any ongoing changes and status updates. SharePoint dashboards are an excellent way to keep track of your document progress, project updates, and KPIs. It’s a simplified way to communicate status updates across the board, in a clear way and at a glance. Representing this core data in one place means it’s easier to stay on track with your targets, as you monitor your ongoing progress. Employees can see where they’re at, with regards to where they need to be, and as a result have more motivation to keep pushing. It’s also a simple way for any associated supervisor to check in on the progress of any reports or projects. 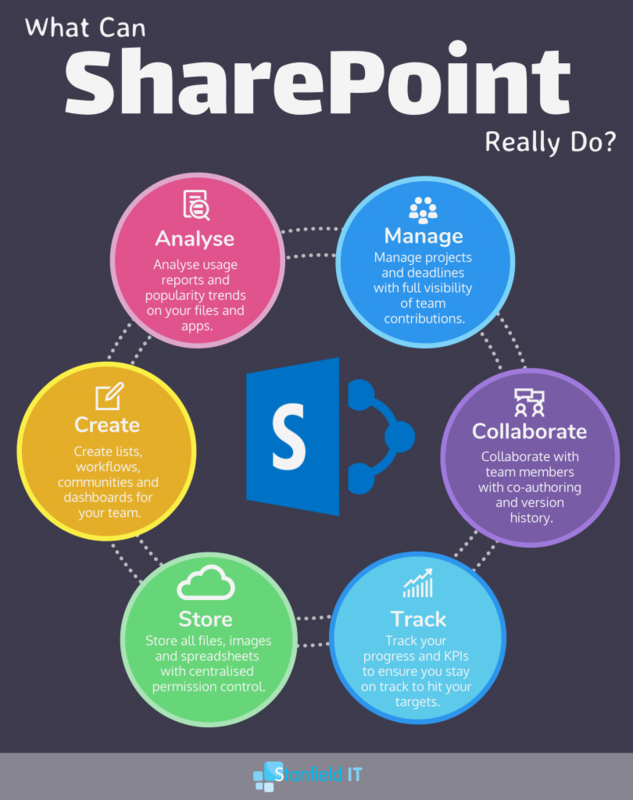 A central function of SharePoint is its ability to explore, manage and create content. So, while this is one of the core functions at the heart of it, it’s also an excellent feature due to the way it performs this function in comparison to other similarly-marketed tools. It’s not enough to just have a dumping ground for all your files and documents. A content management system needs to effectively organise and manage your files as well. Even within the context of a small business, simply having a shared network for file management can get messy very quickly with duplicate files, and inconsistent storage locations. SharePoint enables you to manage who has access to read, write and delete files and with document version history, you can easily follow information about when a file was changed and by whom. You’re probably wondering what are SharePoint lists? Lists are like spreadsheets contained within SharePoint. They are another effective way to manage information. SharePoint Lists are accessible to multiple users simultaneously for collaborative work. Lists can include people, links, pictures, dates and more. You can even track the history of a list item with versions. While a SharePoint list works very much like an Excel spreadsheet, there is a key difference. If an Excel sheet is saved within SharePoint, it’s highly likely that there are still multiple versions of that document floating around your organisation as each user saves a copy on their local machine and edits it. Suddenly you have different versions that don’t match. Keeping your spreadsheet as a SharePoint list means that it’s always up to date and always the correct version. We touched on Dashboards above as a way to keep an eye on KPIs and file activity. However, Microsoft SharePoint goes a bit deeper than that, if you choose to use it that way. The SharePoint site owner is able to view information about how users are interacting with the site. You can view how many people have visited the site, how many times users have visited the site, and which files have the most views. This data is presented in a neat, and simple graph; easy to view at a glance. You can get into even more detail as a SharePoint admin. You can monitor app usage, and error information. Customise a list of which apps you want to keep track of. Then use this function to view details such as the number of licences purchased or used, a summary of errors and installations and usage information. Here’s another excellent tool for managing your work within SharePoint. What is a workflow? It’s much like a flowchart for your document flow process with a huge exception. It actually enforces the process for you. The old way requires you and Karen and Bill to have a whole lot of back and forth to review and approve and update, and remind Bill again that he never sent his approval, and so on (chances are you’ve been in this exact situation before if you’ve ever had to deal with any office bureaucracy). The SharePoint way means that the workflow automatically checks and tracks and forwards documents for you. If someone is late, or hasn’t otherwise completed their part of the flow, SharePoint will generate a notification to nudge them. The Workflow can be designed to collect feedback, approval, signatures or even just publishing approval. SharePoint libraries are more than just a folder to store documents. To use a real life analogy, SharePoint libraries are like the drawer in your filing cabinet. Your drawer contains organised folders and within those folders are all the relevant documents. The ability to organise your documents in such a granular way ensures that everything is efficiently and effectively stored. You can split your libraries based on projects or products, or perhaps by team member. Whichever sorting system suits your needs is how you can do it. Libraries exist within your SharePoint sites, and they therefore inherit the permissions of that site. However, you can also break inheritance meaning you can amend permissions as you need. If you so choose, you can also control permissions on each file or folder within the library as well (you can break permission inheritance at any level). We briefly touched on metadata in the SharePoint vs Onedrive graphic above. To summarise, metadata is data about data. If you have a word document, the metadata is all the information about that document, not the actual contents of it. What’s special about SharePoint is that you’re not just limited to the default metadata entries (ie. file type, file name, modified data and modified by). SharePoint allows you to customise what metadata entries you want to tag your files with. There are nearly 30 predefined metadata entries you can choose to sort by, but the most powerful function here is the ability to create your own custom metadata entries. Consider creating metadata entries like status, office location, or document type (e.g. invoices, minutes, proposal, quotes, etc). The only catch is that you will need to consistently tag your files with the relevant categories in order for SharePoint to be able to sort and find files using those tags. You also have the choice to make these metadata columns globally accessible across the site, or local to a single library. The core functions of what SharePoint can do. We mentioned earlier how SharePoint works hand in hand with Microsoft Teams. This partnership one of many examples of how SharePoint can be used within your business. As you probably know, Teams is a real-time collaboration tool. It would be easy to just call it an instant messaging tool, but that’s not really the point. If you’ve ever had a group project to work on, you’ve needed a tool like Teams. Instead of emailing back and forth, you communicate in real time with one another. It’s really sounding just like a chat program right about now, but bear with us. When you create a Team, Microsoft Teams will automatically create a shared site in SharePoint for your group to work on. Everything that you share within your Team channel, is also shared to your SharePoint site automatically so you’ll never need to do that really annoying thing where you scroll tediously back through an old conversation to find that one document or image that was shared. Don’t pretend you haven’t had to do that! This is one of our favourite SharePoint examples to share, to show how just how effectively it can work within your (dare we say it?) team. We’ve been rattling on about SharePoint permissions now, without really looking into what we mean. Centralised permission control, inherited permissions. What is the significance? SharePoint permissions sound a little bit complicated, but ultimately it’s a system that makes things much easier for you in the long run. As a general rule, in any system, no one user has access to everything. That’s more-or-less restricted to IT admins or perhaps a company-wide director. Enabling different sets of permissions isn’t just about hiding sensitive information from certain employees either, though it can certainly be used in that way. It’s about eliminating superfluous information. John in Marketing doesn’t need access to accounting reports. If he wants to find something in SharePoint, eliminating the irrelevant results makes his job much easier. In a way, this is what permissions is doing. SharePoint works as a hierarchical system. Each site exists within a site collection, which is a group of sites under a top-level site (the root site). Every created site inherits the permission settings of the root site. Following this pattern, lists and libraries inherit the permissions from the site that they belong to. If you are the site owner, you can change the permission settings for the site, and you can change the permission settings for the list or library. If you have control of a list or library, you can also stop permissions inheritance for a specific item (this is called object-level permission). To understand what we mean by centralised permission control, we need to cover how permission levels are assigned to users. A SharePoint group is a set of users who all have the same permission level. Every SharePoint team site automatically has three groups (Owners, Members and Visitors). These groups can create/edit, contribute, or read-only, in that order. If you’re using something like OneDrive, you have to assign permissions individually. You have to go to your file, and manually share access with every single user. If you need to share with a larger number of people, this gets tedious very quickly. And if you need to change or revoke access later on, it becomes complicated to keep track of who has access to what file. Using these SharePoint groups means you can quickly and conveniently assign the same permission level to multiple users. Everything they can access is contained within the same library or site. If you need to revoke access, you don’t need to mess with every single file. You can just remove that user from the group. Voila! Centralised control. It makes things much easier. Let’s cover one last feature before we wrap this up. We ummed and ahhed over including this tool, but ultimately felt it’s still worth a mention. SharePoint Designer is a program designed to customise SharePoint sites and applications. There’s a big but, though. SharePoint Designer was discontinued by Microsoft after the 2013 edition. You can still download and access SharePoint Designer 2013, and it is still currently supported (keyword currently), and yes you can use it with SharePoint Online. However, as it has been discontinued, it does seem likely that Microsoft will gradually stop supporting it until its phased out altogether. To briefly touch on what SharePoint Designer actually does though: it’s an HTML editor tool that allows users to create SharePoint solutions from web publishing, to data integration, further granular control over site objects, and customising your workflows. With this tool possibly on its way out, however, Microsoft experts are suggesting PowerApps, and Flow as tools that fit in this vacated space. Given that SharePoint was previously an on-premise server tool, it stands to reason that it generally just utilised by large enterprises who had the means (and budget) to install such a large-scale product. However, with SharePoint Online now, it’s far more accessible to your average local business. SharePoint is now included with your Office 365 subscription, so there’s no already no additional commitment required. It’s right there. However, maybe you’re one of those enterprises who previously implemented an on-premised SharePoint server. Either way, implementing SharePoint, or migrating to the new system; this move can only empower your business. It can be a daunting step, especially migrating existing data to a new system, but Stanfield IT is happy to chat with you about what you need and how a project like this can come to life.